PhD and MSc in Business Sciences from ISCTE-IUL. He was a Member of the Assembly of the Republic in the XIII Legislature, Vice-President of the European Affairs Committee and member of the Committee on Budget, Finance and Administrative Modernization. He is an Assistant Professor at the ISCTE Business School, at the European University, at the Polytechnic Institute of Setúbal. He is an associate researcher of the Business Research Unit – ISCTE, external expert of the Executive Agency for Small and Medium Enterprises and member of the General Council of ISCTE -IUL. He was Director of the Management Degree of ISCTE-IUL and member of INOUT Global ISCTE Studies Centers. 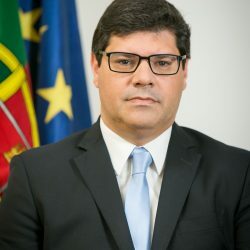 He was Executive Member of the Board of Directors of AICEP (2007-2011), Member of the Board of Directors of ADRAL, member of the Committee of Experts for the Development of the Portugal Logistics Program, consultant in the Logistics and Director of the Logisformação Unit.